Parkinson’s disease (PD), a neurodegenerative movement disorder, affects 1% of the population over the age of 60. Since the discovery of various genes associated with PD, there has been tremendous exploration on the molecular mechanisms involved in the pathogenesis of PD. Investigations on how these mutations cause PD and identification of new genetic risk factors have broadened our vision on PD. Autosomal dominant (SNCA, LRRK2) and recessive mutations (Parkin, PINK1, DJ-1) associated with PD have been explored in various invertebrate (Drosophila, C. elegans) and vertebrate (zebrafish, mouse, rat) genetic models. Although there is no direct evidence that these genes play a role in sporadic PD, a genetic contribution to the disease development cannot be neglected. 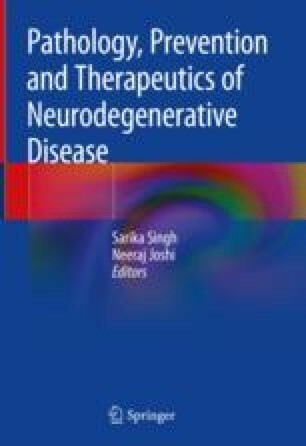 Hence these studies provide cues for the mechanisms that contribute to sporadic PD, especially, in understanding the mechanisms of nigral degeneration and Lewy body formation that are hallmarks of PD pathology. This chapter also reviews different pathways affected by each of these genetic factors that contribute to the big picture of the molecular mechanisms of PD pathogenesis. However, there is a need to improve current genetic models of PD which will provide platforms for testing novel therapeutic approaches. The research grants support from the CMHS, United Arab Emirates University and the National Research foundation, United Arab Emirates to MEH is duly acknowledged.